Home » IPL 2019 – SRH vs CSK – Predict and win double! Chennai Super Kings (CSK) and SunRisers Hyderabad will clash for the first time this season in a match today at Rajiv Gandhi International Stadium in Hyderabad. The last time they met was during the final of the previous year’s edition where Shane Watson’s murderous assault on the hapless SRH bowlers sealed their fate. This year things have changed a lot for both the sides. MS Dhoni-led CSK is comfortably placed at the top with seven wins out of eight matches. On the other hand, SRH is languishing at the bottom of the table with just three wins from seven games. CSK is off from a victory over KKR that saw Suresh Raina coming to form after an indifferent season and have more or less confirmed their place in the playoffs whereas SRH is off from three consecutive losses. Despite having top order woes, CSK still manages to put up inspiring performances with the likes of Rayudu, Raina, Du Plessis and the skipper himself coming to the party to lift the team. And the bowling has been phenomenal with Deepak Chahar and Imran Tahir chipping in with useful wickets. Despite the impressive performance for the openers Johnny Bairstow and David Warner, SRH team has been blowing hot and cold throughout this series. Except for the openers, others have not contributed a great deal. And their captain Kane Williamson’s injuries are not helping their cause. One of the most consistent teams in the last three years, it’s surprising to see them struggle for form this year. CSK has a head-to-head record over SRH with eight wins out of the ten encounters between the two, and also they have won the last four clashes between them. While SRH would be desperate to get back to form, things would be tough against a sturdy and balanced CSK, which at the moment seems unstoppable. This Kane Williamson led side must pull out a peculiar rabbit to get over the men in yellow. From whatever we observed so far in this IPL, the surface on the Rajiv Gandhi stadium seems to be on the slower side so we can expect spinners to make a mark. The battle between men in yellow and men in orange is all set to be engrossing, and delight as both teams have good spinners in their ranks. While CSK start as the favorite, our hearts say, Kane Williamson, who is in due for a big knock may deliver for SRH this time around. We are sure you would have your dream 11 for the match and count on them to deliver to bring you goodies. 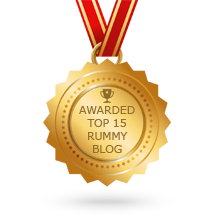 In the meanwhile take note of our 10 Lakhs worth IPL Rummy Fantasy league here at Deccan Rummy. 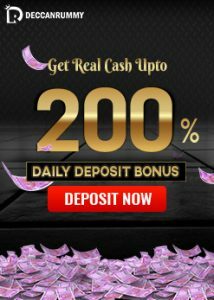 Unlike the regular dream 11 contests, you don’t have to count on the players to bring you prizes; you can use your skills to win cash with a couple of great offers at Deccan Rummy. So, who’s your pick to win? Pick your choice between CSK and SRH and participate in today’s Rummy Fantasy League match tourney at 9 AM and win any cash prize. If your prediction turns out right, we will double your prize money. With IPL Bonanza, you will have a chance to double up on your loyalty points if your prediction comes true. All you need to do is to deposit with the code “SRHvsCSK,” predict the winner between the two teams and play rummy for cash from 3 PM – 10 PM. Our IPL contests are a fantastic opportunity for you to earn some rich cash rewards. Do participate in both the competitions and have a fantastic time. 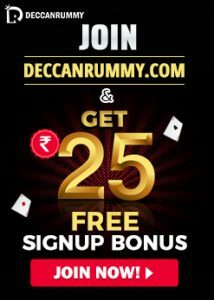 Deccan Rummy caters to sports enthusiasts who are willing to play on our platform with exceptional rewards. It’s time you join and reap one!